Who were the winners at UFC 209: Woodley vs Thompson 2? 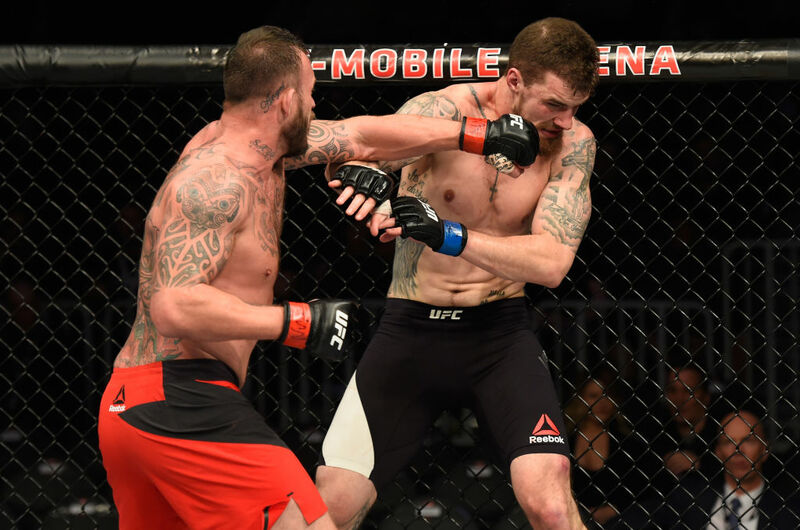 Click below to get the results for all the fights at T-Mobile Arena in Las Vegas on Saturday, March 4, 2017. 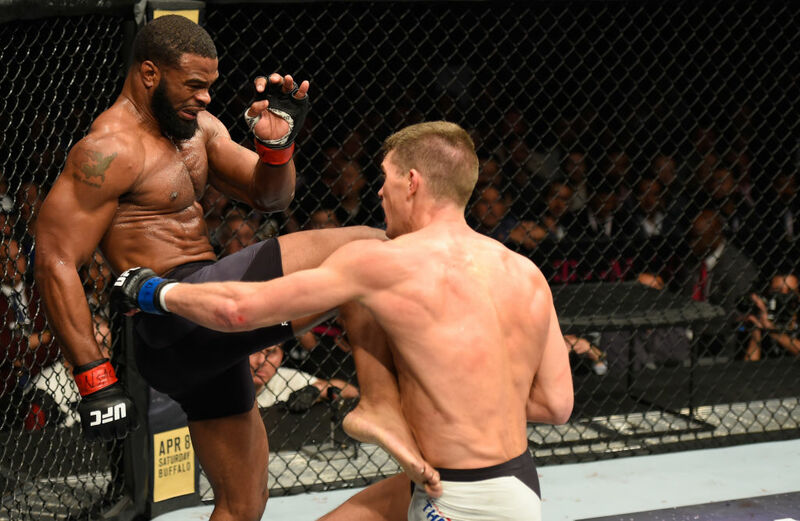 Tyron Woodley and Stephen Thompson went to battle in a tactical chess match in their rematch, and Woodley came away with the win on a majority decision, 48-47, 47-47, 48-47. The champion out-stuck Thompson for the second straight fight, landing 66-42 in total unofficial strikes. Woodley had the two biggest sequences in the fight. In the third round he took Thompson down and landed some ground and pound. Then in the final minute of the fifth, Woodley dropped Wonderboy and came close to the finish before the end of the round. Woodley makes his second straight title defense and puts the Wonderboy chapter of his career behind him for the time being. 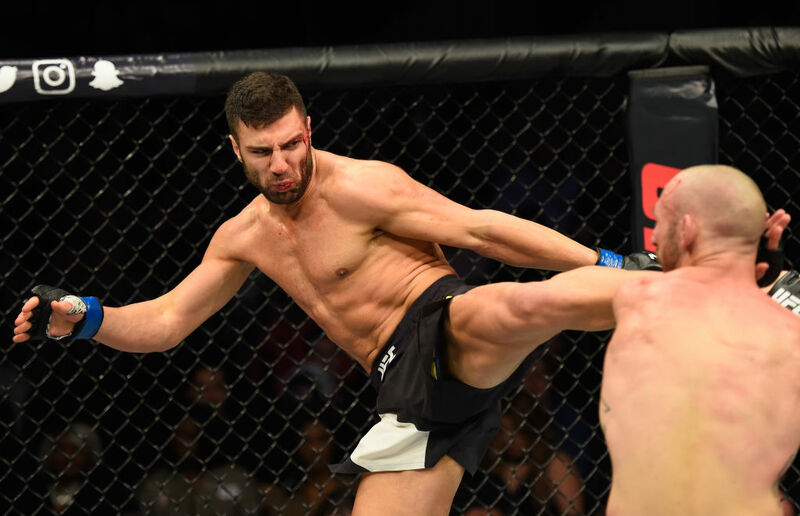 After getting elevated into the co-main event spot, David Teymur and Lando Vannata delivered in a big way with a Fight of the Night worthy scrap. In the end, Teymur took three rounds that were super close to win the unanimous decision, 30-27, 30-27, 30-27. Vannata had Teymur rocked in the first round, but Teymur survived and used his exquisite striking attacks to out-score Vannata, 73-66 in total strikes. Teymur improves to 6-1 and a perfect 3-0 in the UFC. 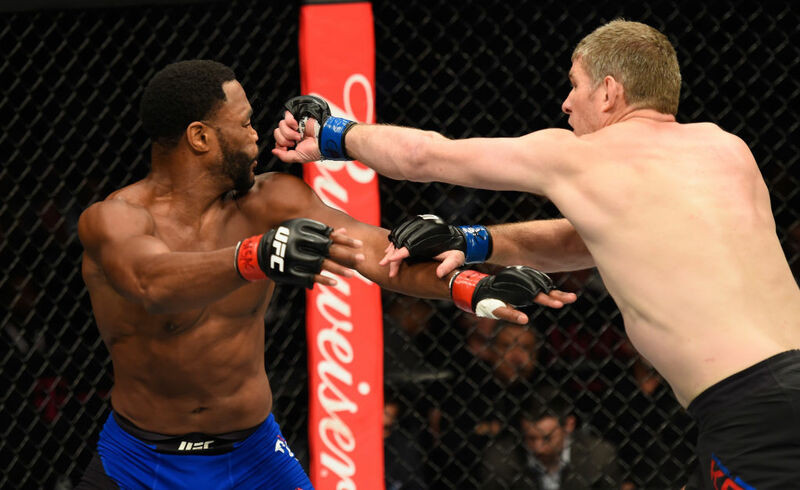 Rashad Evans never seemed to get into a rhythm in his middleweight debut and Daniel Kelly capitalized, out-striking the former light heavyweight champion to earn a split decision win, 28-29, 29-28, 29-28. Kelly landed 89 to just 53 for Evans, who has now lost three in a row. Kelly extends his win streak to four in a row. Daniel Kelly: “It means the world to me to fight someone like Rashad Evans. I really appreciate Rashad picking me to fight him and it just shows that us Aussies can fight at the top level in the UFC. “I think I had more forward pressure, I think I hit him a little bit more than he hit me; granted he took me down, but he couldn’t get any control. I think the forward pressure probably won me the fight. That, and the dirty boxing. Cynthia Calvillo made quick work of Amanda Cooper in her UFC debut, submitting her by rear naked choke at 3:19 of the first round. Calvillo got a hold of Cooper with an anaconda choke during a scramble and used it to transition to her back. Once there, Calvillo applied the pressure until she was able to submit Cooper. Calvillo is a member of Team Alpha Male and improves to 4-0. Cynthia Calvillo: “I feel amazing, I feel great, but overall this doesn’t surprise me. I’m prepared, I train with the best team in the world and it went just the way we planned it. We are the best team in the world (Team Alpha Male), we have the world champ, Cody “No Love”, we have the best coach in the world – I don’t know how Justin Bucholz didn’t even get nominated for coach of the year, he was hands down coach of the year. 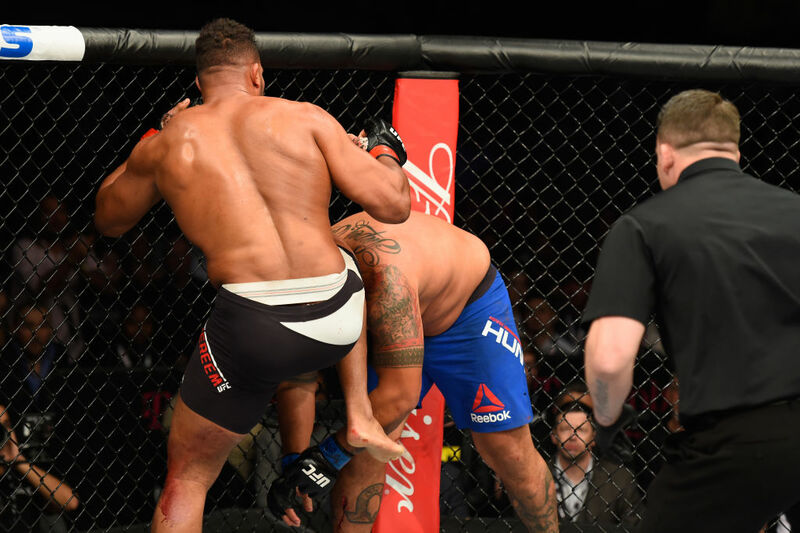 Alistair Overeem landed a pair of savage knees to the head of Mark Hunt, dropping the power puncher in the third round to win by TKO. Hunt did some damage with the little offense he was able to mount in the fight. He had Overeem wobbled in the second round with an elbow that landed right on the button. Overeem employed the same gameplan he’s been implementing lately, using his distance to stay outside and getting out of the pocket to not allow Hunt to use his power. Overeem now has won five of his last six and said after the bout that he’s not done yet. Alistair Overeem: “I am very proud, but I am also very proud of my team. This is a great group of guys surrounding me and we might be old, but we’re not done yet. We see a lot of things (when we watch film), we studied my opponent very extensively, all my coaches do, and I think that combined with my ability, technical ability, athletic ability, I’m able to put these guys away. It was a pretty even fight through two rounds, but in the third frame Marcin Tybura turned up the pressure and the output, landing 24 significant strikes that ultimately led to the TKO finish at 3:36 of the third round. Tybura improves to 15-2 and picks up his second UFC win. 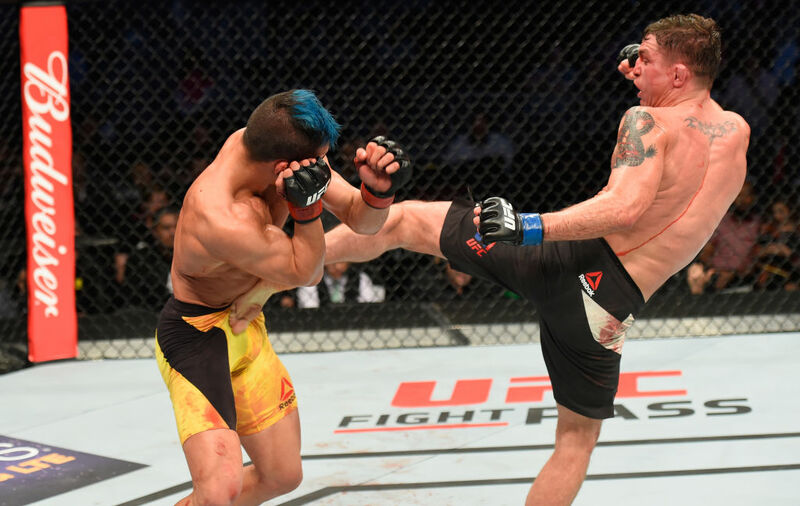 Darren Elkins was on the receiving end of 121 strikes as he was battered for the better part of 13 minutes against Mirsad Bektic. But the Team Alpha Male product, resilient as anybody on the roster, showed off his toughness, taking all the elbows and punches dealt by Bektic before turning the tables and landing the finishing head kick at 3:19 of the third round. Elkins roared with all the energy he had left in his body as he walked away from the downed Bektic. Elkins hands Bektic his first-ever loss and extends his own win streak to four in a row. 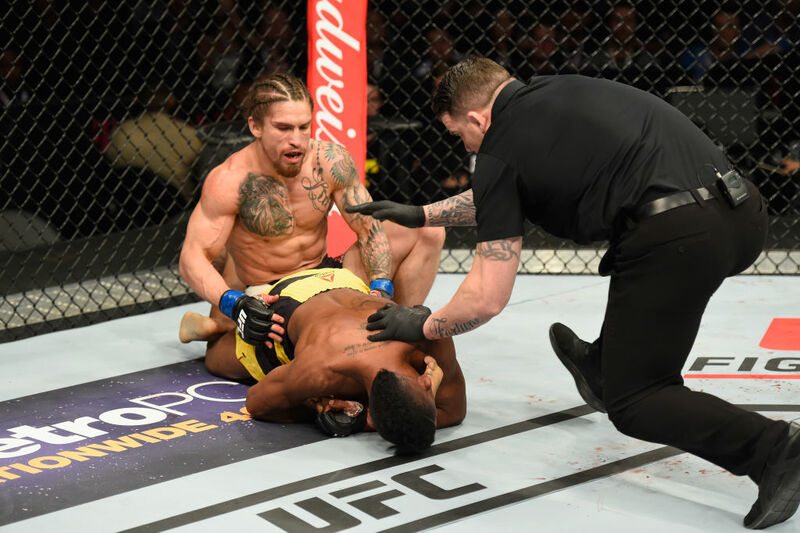 In a crazy fight, Iuri Alcantara pulled off the comeback win with a kneebar out of nowhere to submit previously undefeated Luke Sanders at 3:13 of the second round. Sanders dominated the first run and it seemed like he was close to finishing on a few occasions as he was raining down big shots from top on the ground. Sanders also was deducted a point because of an illegal knee to the head of a downed Alcantara toward the end of the first round. In the second, Sanders was having his way once again and seemed to rock Alcantara but just as quickly Alcantara scrambled and got a hold of Sanders’ leg and the finish followed. Mark Godbeer picked up his first UFC win with a dominant win over previously undefeated Daniel Spitz by unanimous decision, 30-27, 30-27, 30-27. Godbeer landed 90 significant strikes and rocked Spitz on several occasions, but both fighters had their gas tank on “E” by the final horn. Spitz landed the only takedown of the fight but was out-struck 98-64 overall in the bout. 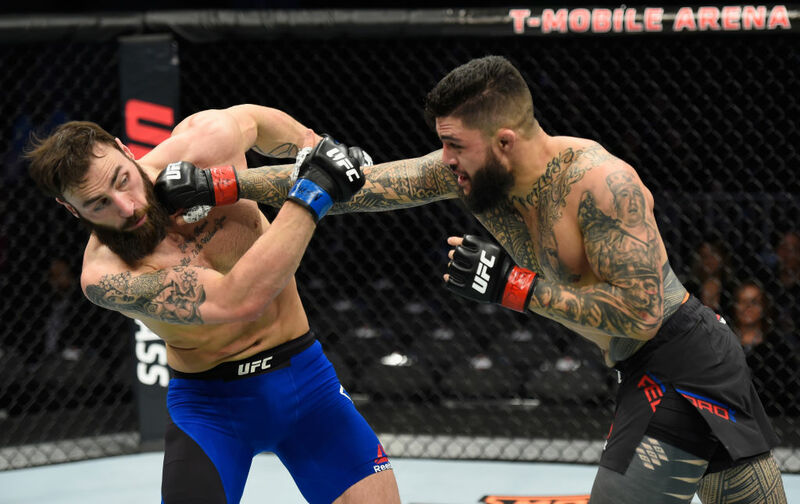 Tyson Pedro continues to impress inside the Octagon, picking up his second straight UFC win to improve to a perfect 6-0. In a division hungry for prospects, Pedro has declared himself the one with the most potential. Pedro made quick work of Craig, landing a straight right hand that rocked him before a pair of knees landed to drop Craig. Pedro followed up with some ground and pound elbows before the referee pulled him off, declaring him the winner at 4:10 of the first round. Tyson Pedro: “I’ve said it before every fight, I come to finish the fights and I finish them in the first round. I respected my opponent completely, I think he underestimated me a little bit going into the fight, so that’s not bad on his part – a lot of people think I’m immature in the sport. I’ve been doing this for a long time and my record doesn’t speak for what my experience is. All I need to do is keep coming in as the underdog, because I like that. In a back-and-forth affair, Albert Morales pulled off the win in a split decision (29-28, 28-29, 29-28) against Andre Soukhamthath in the evening’s opening bout. Morales landed a few key takedowns to sway the judges after the two did about the same amount of damage on the feet. 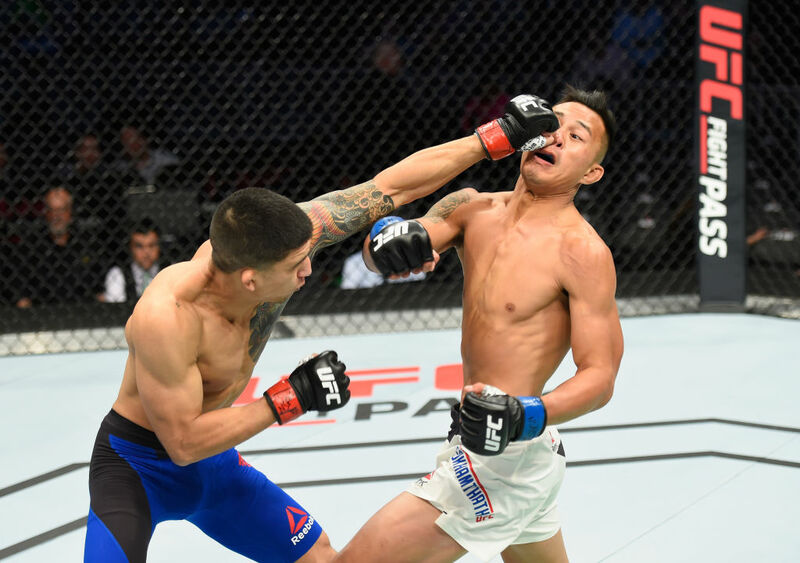 Soukhamthath had his most success in the second round and then in the third round he landed a number of left hooks to the body, but Morales got a takedown to clinch the round and end Soukhamthat’s momentum. Morales picks up his first win in the UFC over the debutant Soukhamthath.